This is a great regional Oracle User’s Group conference with some of the best speakers you’ll find on multiple subjects! Something enticing about being in freezing cold temperatures during ski season I think? My colleague Kellyn Pot’vin-Gorman does a great job promoting it and making sure people get a great educational experience. If you’re in the area, it’s a great 2 day conference! See the agenda and register now! Every time a new plug-in, patch or PSU comes out for Enterprise Manager, I get a series of questions. I’m going to quickly address a few of the ones I’ve gotten this month with the release of the new plug-ins and the PSU patches to try and help you in updating your EM site. I wrote a detailed blog EM Patching 101 about the various patches, and that’s still relevant so read if you haven’t (or read it again)! What’s the difference between the Plug-in release (released 1/5/2015) and the Plug-in system bundle (released 12/31/2014)? The plug-in system bundle will come out every month on the last day of the month. The next one is scheduled for 1/31/2015. This is a cumulative compilation of monthly plug-in bundle patches. So it will look at what plug-ins you have installed on the OMS, and it will deploy the latest plug-in patch bundle to that plug-in. It will skip what you don’t have installed. These patches will include fixes and will be indicated by the 5th digit in the version. For example, the latest Database plug-in patch was 12.1.0.6.7. The plug-in updates released on 1/5 were full plug-in version upgrades. These need to be deployed to the OMS by using Extensibility -> Plug-ins and deploy to OMS. They may require downtime. Plug-in updates for Database, Fusion Middleware, Storage Management and Cloud were released. These updates include new features and fixes. For example, the Database plug-in is now 12.1.0.7.0. Which one should I apply? My recommendation would be to test and apply both. The plug-in updates for Database and other components you use have the latest features and code that will enable new features or improvements. You will also want to apply the latest system bundle patch (whether it’s December’s or January’s) to patch the other plug-ins that did not get updated (MOS for example). Should I deploy the new Plug-ins first or apply patches first? My suggestion is to apply the Plug-in updates first. The plug-ins released in January include Database, Fusion Middleware, Cloud and Storage Management plug-ins. When you download and apply these to the OMS, and Agents if required, they will not need the patches from the December 31st patch bundle, and you’ll have the most recent update. After deploying the plug-in updates, when you apply the Plug-in System patch (20188140) you will see that the updated plug-ins (DB, MW, etc) are skipped. How often should I patch EM? Agents? I recommend to most my customers to stick to a quarterly patching cycle, and this typically follows the PSU cycle. So start looking at the patches that are released in the January PSU and testing them. At that time, grab all the recommended or latest plug-in and agent patches, and apply those as well. The agent and plug-in patches will come out monthly, and if you need a patch for a particular bug or issue, then you should apply. However, patching EM monthly is not feasible for most customers. What patches do I need to apply as of now (January 2015)? When I apply Weblogic PSU it has a conflict, can I roll it back and how do I do it? You must first deinstall the conflict patch first, and install the new PSU. The patches are cumulative. How do I apply the Oracle Help Patch (20075252)? The January PSU calls for 17617649 on the Oracle Help product but this conflicts with a pre-existing EM patch. There is a merge patch 20075252 that is available for this. 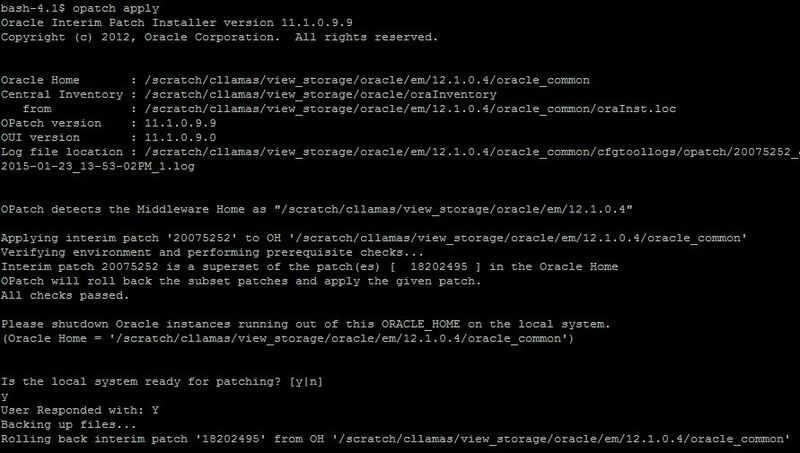 The Oracle Help patch is applied to the <MW_HOME?/oracle_common and uses the OPatch from that directory as well. Read the readme.txt for full patching steps, but some tips are listed here in applying. How do I apply the OPMN Patch (19345576)? Following the readme.txt it wants you to set Oracle Home to the Classic/WebTier home. For EM, this is the MW_HOME/Oracle_WT directory. Let me know if you have any other patching questions and I’ll add them here! I’m excited to do another webinar for IOUG this year, covering EM install and setup. Be sure to register! The goal in every Oracle Manager 12c rollout is to take it from zero to manageability in the shortest time possible. This presentation will show you how to accomplish this feat. Speakers will demonstrate how to properly architect and deploy Oracle Enterprise Manager 12c implementation, including designing for high availability and scalability. Through this demonstration a list of essential techniques and tips compiled from Oracle Enterprise Manager Development’s Strategic Customer Programs team will also be shared. Topics such as users, roles, groups, templates, and incidents will be discussed, plus key architectural decisions. This is a great regional Oracle User’s Group conference with some of the best speakers you’ll find on multiple subjects! Something enticing about being in freezing cold temperatures during ski season I think? I don’t ski, but I love this conference because I can get a little personal benefit from it. I grew up in Fort Collins, CO and proud to be a CSU Ram. I still have many friends and family there so when I get back I try to meet up with someone! My colleague Kellyn Pot’vin does a great job setting up the agenda and making sure people get a great educational experience. If you’re in the area, it’s a great 2 day conference at reasonable rates. See the agenda here and register. I will be presenting Enterprise Manager 12c: Extending Beyond the DBA on Thursday at 11:15. Several of my colleagues will also be there presenting and providing Hand on Labs covering Enterprise Manager and we’ll also be holding an EM Roundtable to wrap up the conference. Last year was my first year at Collaborate and I was surprised at how big and diverse this conference was for a User Group sponsored event. They’ve done a great job making it a full week of great sessions, exhibits and labs! If you haven’t gone before, maybe this is the year to check it out? You can find out about registration here. I don’t have the schedule for my sessions, but I do know it’s going to be busy! I have two sessions scheduled so far – Zero to Manageability in One Hour: Build a Solid Foundation for Oracle Enterprise Manager 12c and Smarter Monitoring with Adaptive Thresholds and Time Based Metrics. I’m also co-presenting with Werner on Under the Hood of Enterprise Manager – a Troubleshooting Primer. We’re hoping to get a Hand on Lab set up for EM as well, still waiting for word on that! Besides, who doesn’t love a few days in Las Vegas? This year the conference is at Mandalay Bay, which is where my husband and I got married almost 12 years ago. Hoping to get him to join me for a few days if we can line up a sitter! That should be enough for this Spring right?? At least for me it is!